Squab with Soy Maple Stuffing, Mushrooms and Roasted Grapes | Eat.Drink.Life.Love. So…here’s a fun thing: We just won a contest from Open Table. They asked people to tweet something along the lines of “I want to win dinner in NYC at Top Chef Kitchen.” So I did. And I won. What are the odds of two people who’ve cooked their way through three years of Top Chef, have a blog about cooking Top Chef food and who honeymooned in New York City winning this contest?!? I’d say a kajillion to one. But there you go, we won and I’m so excited to go to New York City next week I’m like a little kid the night before Christmas. Top Chef Kitchen is a temporary pop-up restaurant in Tribeca and different Top Chef contestants cook each week. The evening we’re there, we’ll be treated with four courses (plus wine pairings) by Tiffani Faison and Jennifer Carroll. In eager anticipation of our whirlwind adventure next week, we did an adaptation of Tiffani’s soy maple-stuffing with quail, mushrooms and grapes (original recipe here). 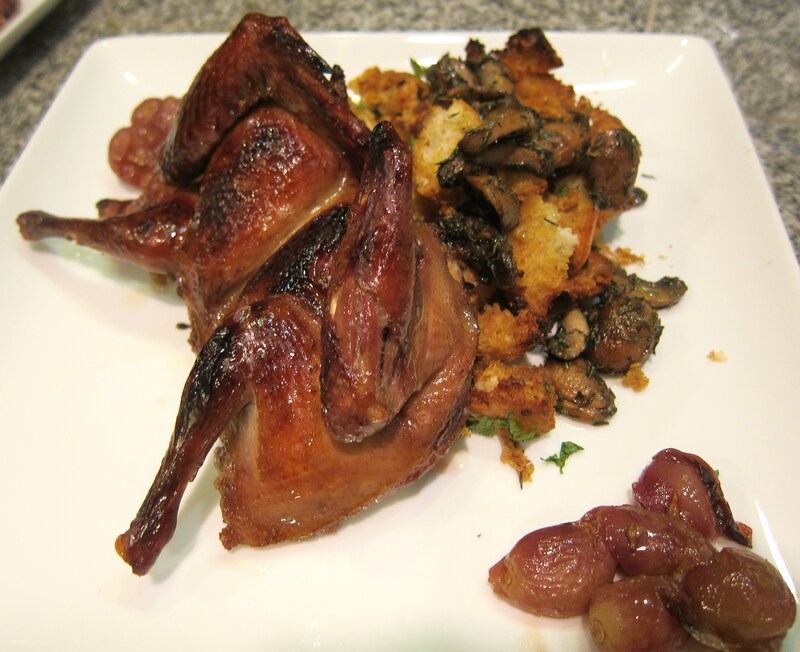 Here’s our version: Squab sous vide with soy maple stuffing, mushrooms and roasted grapes. First things first, spatchcock. Not only is it fun to say, it was pretty necessary to make sure the squab cooked evenly, fit in the sous vide bag and was easier to eat. 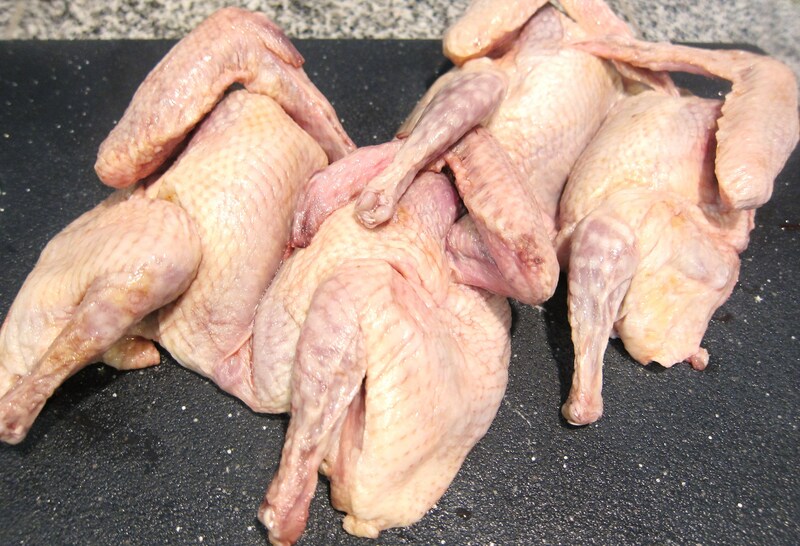 Spatchcock simply means to cut out the breastbone and backbone so the bird lays (relatively) flat. Use a super sharp kitchen scissors to cut out the breast bone. Then carefully and under the skin, cut out the backbone. Heat the sous vide machine to 148 degrees F. Load the squab into a sous vide bag and add the marinade. Seal up the bag and pop everything into the sous vide machine to cook for 6-8 hours. Gather your ingredients for the rest of your meal. To make the stuffing: Tear up and toast the bread until it’s golden on the outside, but still tender inside. Beat the eggs and mix into all the wet ingredients and spice. Put bread into a baking dish and pour the wet ingredients over. Mix until the bread is well coated (it’s easiest to use your hands for this). Sprinkle the pine nuts and parsley over the top. To roast the grapes: Thoroughly wash the grapes and place individually (not in clusters) on a baking sheet. 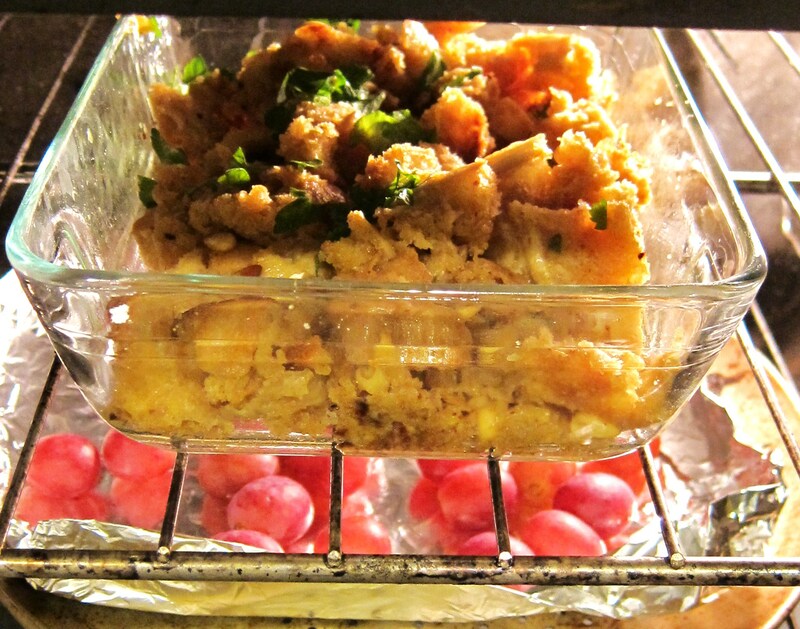 Bake the stuffing and roast the grapes at the same time. If the stuffing is getting too brown, turn the heat down to 350. 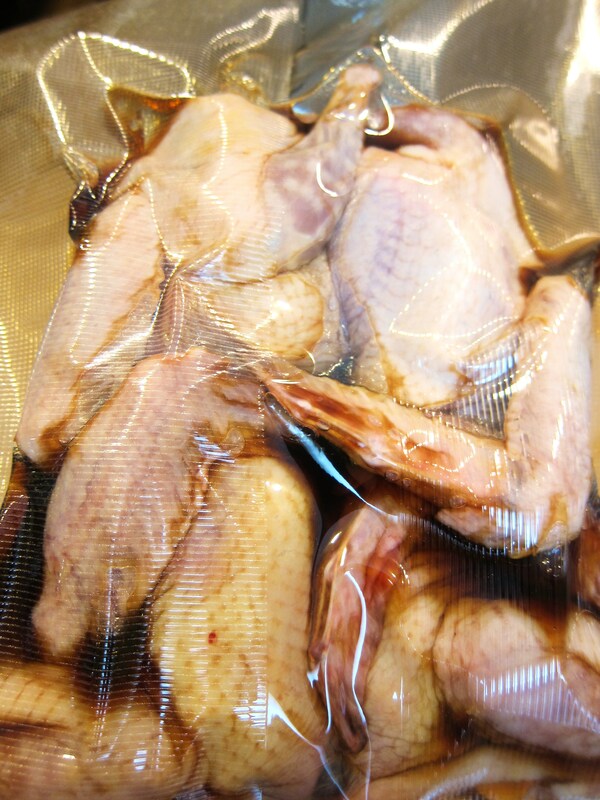 Remove the squab from the sous vide machine and take out of the bag. Your home will smell like Thanksgiving at this point. Place squab on a foil-lined baking sheet and put under the broiler until dark brown and crispy (8-10 minutes, but keep an eye on it — cooking time depends on the broiler). Heat the olive oil in a saute pan and slice the mushrooms. Saute the mushrooms with the thyme until browned. When everything is ready, place the stuffing on your plate and scatter the mushrooms over it. Lay the squab over the stuffing and add the roasted grapes to the side of the plate. Salt and pepper everything to taste. Would we make this again? Mmm, ummmm, mmmmm…sorry, I was too busy enjoying this fabulous meal. The grapes were soft and sweet, the stuffing crunchy with layers of flavor. 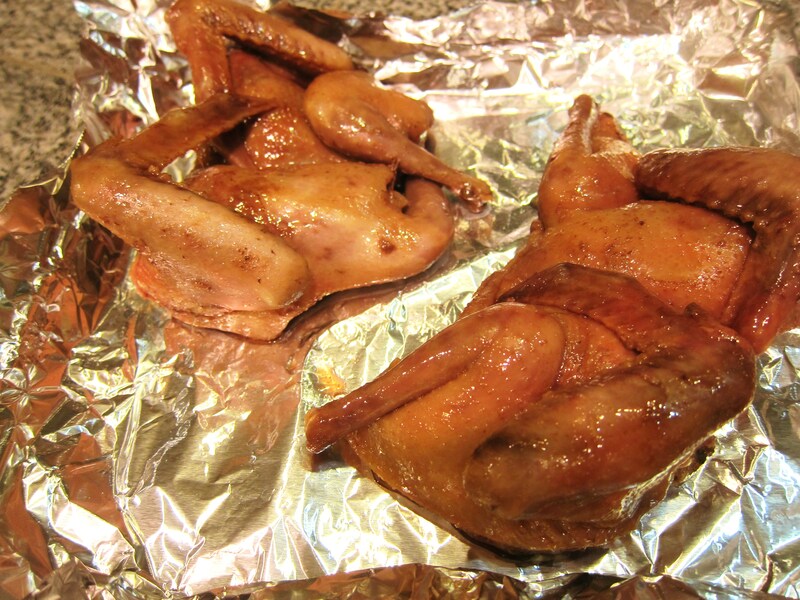 The crispy skin of the squab concealed tender and rich dark meat. It was like super fancy Thanksgiving dinner. So if we happen to have a few squab hanging around in the freezer, yes … we would make this again. Stay tuned for a report on Top Chef Kitchen and New York City fun! Tee-hee. Spatchcocked squab 🙂 So excited to hear about your NYC adventure! !